The Samsung SH100 is a 14 megapixel digital camera that is now in stores with a shelf price of $199.99. This is one of the first Samsung cameras to come equipped with a Wi-Fi feature for uploading photos to your favorite social media network. The SH100’s Wi-Fi feature even enables the camera to connect to a Samsung Galaxy X Android smart phone and use it as a viewfinder for your pictures. With all of these excellent wireless features that come bundled with this camera, let’s take a look and see if your next digital camera purchase should be the Samsung SH100. integrate the ability to upload photos to all of your social networks directly from the camera, because that is where most users post their pictures. Each time that a picture is taken, the user is shown a menu giving them the options of what they would like to do with their new photo. Users can choose to post it directly to Facebook, Twitter, or even email it to a friend. When choosing to send a picture over email, the camera is equipped with a built in address book so that every user has a list of their friends and families emails directly on their camera. When uploading pictures to Facebook, users can view their other uploaded albums from their Samsung SH100. The ability to even comment on other pictures is refreshing and something that I have not really seen on many other cameras. Those using the camera to shoot short and simple videos will be impressed with the integrated YouTube upload feature. After a user has recorded their video, they are prompted with a YouTube menu for uploading purposes. If the user has an account, they will be automatically logged in each time for ease of access while trying to put their new video on YouTube. Windows PC’s will be able to have videos transferred directly to their desktops through a wireless connection. The camera is smart enough to detect all of your new pictures so that your computer does not become filled with duplicate photos. Software included with the camera will have to be installed for this feature to work properly. Overall, the features of the Samsung SH100 are nothing short of impressive. 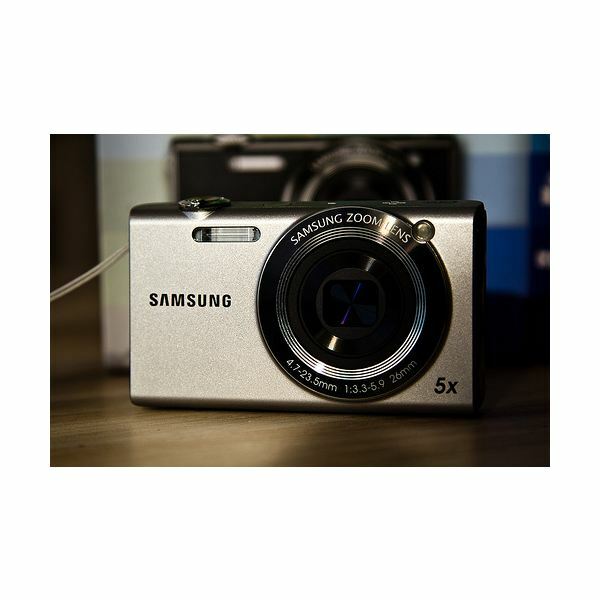 The Samsung SH100 has a very sleek design, and was made to be an easily portable digital camera. It weighs 3.8 ounces and is only 2 inches thick, which is a decent size to carry around without a hassle. The cameras 14-megapixel lens has a 5x zoom, but it does not have any sort of stabilization system included. A 3-inch touch screen is located on the back of the camera, but for those prefer to use buttons should not worry, because all of the common buttons are still included. The buttons on the camera control features such as playback, shutter release, zoom in/out, and a home screen button. Samsung made the SH100’s display similar to the Samsung Galaxy X phone. The applications and layout are almost identical, with every button lying on top of a black background. Also the letters that are presented when typing are the same as the Galaxy X’s text messaging screen. Luckily, the touch screen on the Sh100 is very responsive. Every time that I touched a feature on the screen it appeared immediately with no delay, except for some times when I would upload a picture. This, however, is because of the Wi-Fi connecting. The image quality of the Samsung SH100 is average compared to other digital cameras on the market. There are areas where the camera lacks, such as corners not being as crisp as they should be and sometimes appearing a little choppy. However, the colors are quite vibrant in all of the pictures that I have been shown. The Smart Auto feature of the camera really does help users when it comes to point and click picture taking. From what I have seen, none of the pictures required any adjustments after using Smart Auto. During night shots, the SH100 seems to struggle a little bit, leaving shots with jagged edges and blurring affects. The video feature of the camera is decent, at best, for people trying to film longer videos. However, for people that are just shooting short simple clips, this camera’s video will do just fine. The video quality and sound comes out clear and is perfect for uploading to Facebook and YouTube. Night shots are still lacking, but what do users expect from a digital camera? My final verdict would be that this camera is one of the top digital cameras on the market at the moment. For people addicted to social media who want to share their pictures and videos with the world, the Samsung SH100 would be the perfect pick with its Wi-Fi capabilities. If you were to go out and choose a digital camera, I would put this at the top of your list while shopping around. The information provided in this article is based on the author's personal experience owning this digital camera.